For four to six weeks, team members experience the host country’s culture and institutions, observe how their vocations are practiced abroad, develop personal and professional relationships, and exchange ideas. 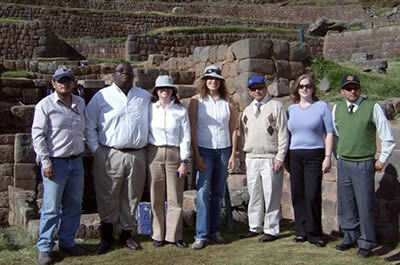 In a typical four-week tour, applicants participate in five full days of vocational visits, 15 to 20 club presentations, 10 to 15 formal visits and social events, two to three days at the district conference, three to four hours per day of cultural and site tours, and three to four hours per day of free time with host families. Over the past several months, District 6880s last outgoing GSE team has been preparing for their upcoming exchange trip seven thousand miles away to District 3750 Gyeonggi-do, South Korea. The Rotary Group Study Exchange (GSE) was founded in the mid 1960s as an opportunity for non-Rotarians to promote international goodwill and understanding around the globe. This Foundation funded educational opportunity is unique in that these GSE team members gain exposure to the world of Rotary locally and internationally. The 2012-2013 GSE Team is comprised of four young professional non-Rotarians (April Hopkins, Elizabeth LaGrave, Nagea Austin, and Amanda Murdick) and their team Leader Sujin Kim who is a member of the Rotary Club of Mobile. Sujin was born and raised in Seoul, Korea and was a 2001 GSE team member to Mumbai, India. Currently, she is a business immigration lawyer in Mobile where she resides with her husband. The GSE Team is fortunate to have a team leader from the country where they will spend four weeks immersed in the vocations and culture of a country many never imagined they would visit. To prepare for their adventure, the team is spending time meeting and making new friends within the local District’s Rotary Community. In June, they toured the Hyundai Motor Manufacturing and the Hyundai Power Transformers plants in Montgomery. Along the way, they met and dined on Korean food with three PDGs, Tom Mann, Joe Saloom, Carol Franks and DG Jim Golson. The team is also visiting their sponsoring clubs and is looking forward to returning to Montgomery again prior to their departure next month. Between preparations and meetings, the team is taking a crash course in the Korean language. 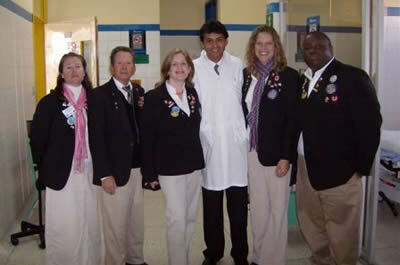 An important part of the GSE program is the language program, which is funded by Rotary International. Although learning a new language in less than three months is a daunting endeavor, it is an integral part of the process and helps acclimate the group to the Korean culture. For four weeks, October 12 – November 12, the 2012-2013 GSE Team will participate in a myriad of cultural and vocational activities and travel to many of District 3750s ninety-two Rotary Clubs. One of their stops will include Pyeongtaek, which is Mobile’s sister city and also an important U.S. military hub in the region. The team’s visit will conclude with a presentation to the District 3750 Conference in November. Upon their return, the GSE team will share their stories, photos, and adventures with local clubs. The team is grateful for the support they have received in this endeavor from Rotary International and Rotary clubs members throughout the district and eagerly await the journey of a lifetime. What an interesting and great Program our Team members are conducting! It is truly my pleasure to see and feel their excitement and enthusiasm during the first week toward learning about Korea from a perspective they have never had before. Last Wednesday, we had a meeting with the Mayor, Kim Su-Ki, to re-activate the sister city relationship between Pyeongtaek and Mobile. As the GSE Team Leader and a Rotarian, I am immensely excited about the role the Team is playing. Indeed, it is challenging in many ways, as you know; however, I am doing my best so that our Team members can achieve the most out of this 4 week program for themselves and D. 6880. Please keep us in your prayers and thoughts. I hope I can write you again soon. Thank you.